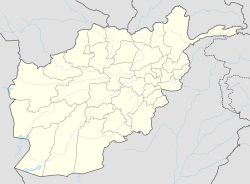 Adraskan is a district in the central part of Herat Province in Afghanistan. It is bordered to the west by Iran, to the north by Ghoryan District, Zinda Jan District, Guzara District, Pashtun Zarghun District and Obe District, to the east by Farsi District and to the south by Shindand District. The population was estimated at 52,200 in 2012. The district is large; the eastern part is much more populated than the west. The Adraskan River flows from east to south through Adraskan. The main road from Herat to Kandahar passes in a north-south direction through the district center, the ancient town of Adraskan. ^ a b "Settled Population of Herat Province" (PDF). Central Statistics Organization. Retrieved 30 December 2015. ^ "Summary of District Development Plan" (PDF). Adraskan District Development Assembly. Archived from the original (PDF) on 2016-03-03. Retrieved 30 December 2015. This Herat Province, Afghanistan location article is a stub. You can help Wikipedia by expanding it.